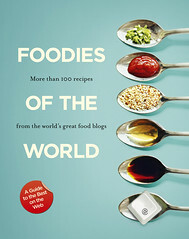 ‘A Slice of Cherry Pie’, is featured in the book ‘Foodies of the World’, published by The Slattery Media Group in October 2010. The publication is a collection of profiles and recipes from the best blogs around the world and it covers an international spread of cuisines, courses and recipe styles, as well as profiles of the bloggers themselves, who come from all corners of the globe. For more information and to purchase a copy of the book visit The Slattery Media Group website.